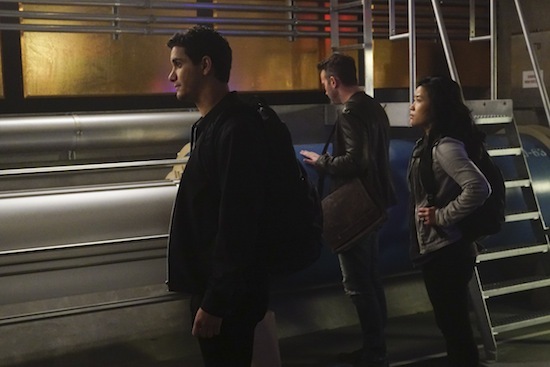 SCORPION is back after its Olympics hiatus…but the team isn’t exactly at the top of their game. In Monday’s episode, “Dumbster Fire,” Walter (Elyes Gabel), Happy (Jadyn Wong), Toby (Eddie Kaye Thomas), and Sly (Ari Stidham) find their IQs drastically dropping while trapped on a case—with Paige (Katharine McPhee) and Cabe (Robert Patrick) their only real chance to survive the experience. The stakes of the case are pretty freaking high…Team Scorpion is attempting to prevent the creation of a black hole. Ralph (Riley B. Smith) takes it upon himself to play matchmaker for Sylvester and Florence (Tina Majorino). The kid is hilariously persistent. Walter’s decreasing IQ allows Paige to see a new side of her boyfriend. Happy and Toby are continuing their path toward parenthood. Unfortunately, their attempt to make a big decision is derailed by indecision…and even bribery may not be enough to fix things. Um, never play Pictionary with Walter unless you have a genius-level IQ.